I did a little math toward the end of the game at the center of tonight’s episode—a sequence with some of the best football action this series has seen—and figured out both the numbers and the dramatic arc of this particular contest would put the outcome on Landry’s shoulders. It wasn’t that hard to call, really. 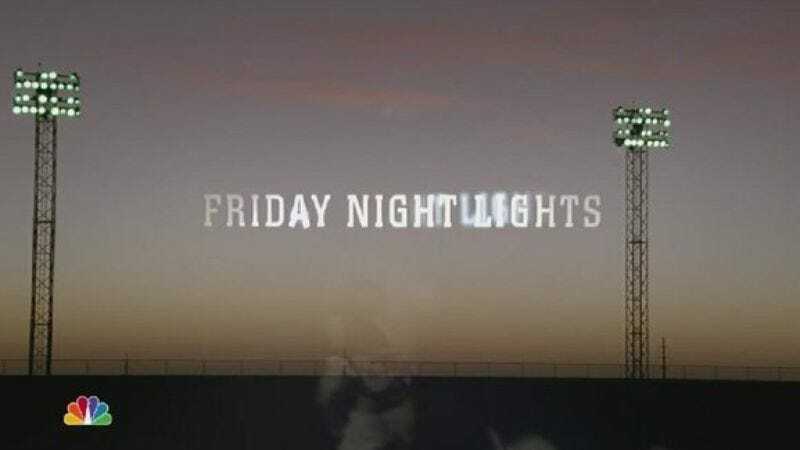 For as much as Friday Night Lights is rooted in the conflicts and dilemmas of some beautifully crafted three-dimensional characters and drawn from the details of life in a particular part of the world, it’s still a TV show and has to do a TV show’s work. There are certain rules that even the least clichéd shows must follow. The game wasn’t going to end as a one-sided blow-out or give the deciding play to some third-stringer with whom we’d spent no time. But I honestly had no whether that football would stay true, fall short, or go veering off in one direction or another. It’s the sort of show where any outcome would make sense. More importantly, I really cared where it would land. That the game of football means too much to Dillon, a town that emphasizes the sport over virtually any other aspect of life at times, has been a recurring theme since the first episode. But so has the game’s ability to reflect life. Landry’s field goal—45 or 72 yards, depending on who’s doing the telling—allowed him to grab some victory while still dealing with the personal defeat of losing Jess to Vince. It’s just a game, but that moment mattered, both in itself and as a symbol for finding hope in the midst of a lot of apparent hopelessness. Then there’s Tim. It didn’t occur to me until we hit the shot of Tim watching Billy and Mindy and their new baby that he’d make a Sydney Carton of himself by taking the rap for Riggins Rigs’ after-hours chop shoppery. But it makes all the sense of the world for the character. To say that Tim began the series caring about no one but himself isn’t fair. He clearly had deep feelings for Street, Lyla and others. They just didn’t often get in the way of his own pleasure-seeking. An adult now, he lays down his freedom for the sake of Billy’s family and to win back Becky’s respect. Tim doesn’t say much at the Thanksgiving dinner, but he clearly takes Billy’s awkward, affecting speech to heart. Keeping his place in the extended family gathered there means sacrifice. Sometimes insuring those moments of togetherness Billy treasures means going away. Some victories feel like defeats. Togetherness has a way of vanishing, too. The episode ends with Saracen, Chicago-bound and Julie-less again and looking sad even with an excited Landry by his side. Will we see him again? 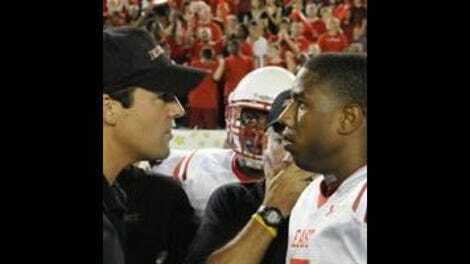 As Friday Night Lights heads into its fifth final season, his character’s future remains unclear, a football sailing toward some landing place we can’t yet make out. • Can’t go without mentioning how great Michael B. Jordan was as Vince this week. I loved his scene with Coach in which he expressed doubt at his abilities and received no reassurances beyond Coach’s refusal to entertain his insecurity. Even better: his Thanksgiving dinner with Jess and his mother. Jordan and Jurnee Smollett have an easy chemistry together. As much as I liked Jess and Landry’s sweet, awkward courtship, the way Smollett and Jordan conveyed their characters’ growing attraction made it pretty clear Landry’s days were numbered. • Kudos, too, to Matt Lauria as Luke, who ends the season as he began it: eager to please in spite of the trouble he’d gotten himself into. • In fact, how about a round of applause for the whole new class by mentioning Madison Burge’s work? I had my doubts about her at the beginning, but it turns out she was simply playing the immature schoolgirl. She beautifully captured a girl watching her callowness get battered away bit by bit. • Nice to see Louanne Stephens as Grandma Saracen again. She’s been missed in Matt’s absence. • Did anyone else think we’d see more of the McCoys this year than we did? • Have we seen the football announcers before? • Did I forget anything before we leave this season behind?